It has been a busy quarter. 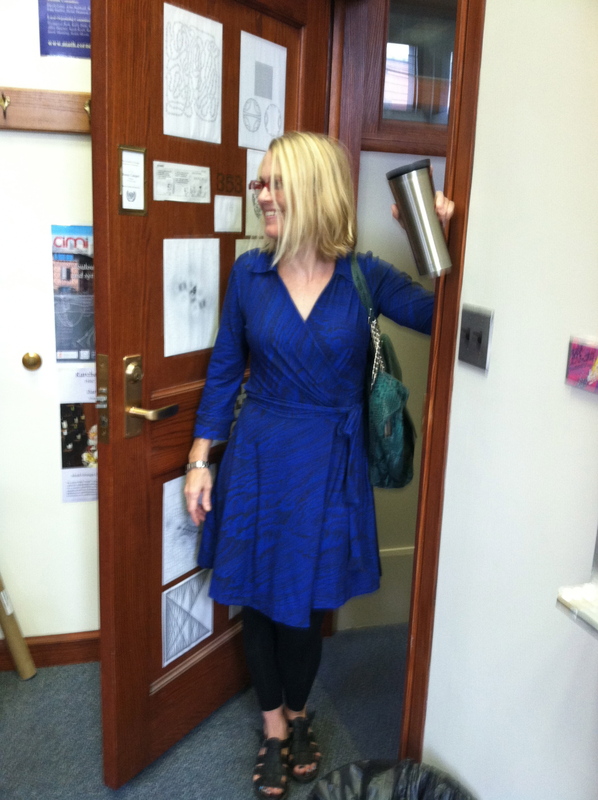 Since August, I have made 10 trips, to conferences or to give colloquia. On 8 out of the 10 trips, I talked about a recent joint project with Sarah Koch and Alden Walker, on a topic in complex dynamics; our paper is available from the arXiv here. Giving essentially the same talk 8 times (to reasonably large crowds each time) is an interesting experience. The same joke works some times but not others. An explanation that has people nodding their head in one place is met with blank stares in another. A definition passes without comment in one crowd, but leads to a prolonged back-and-forth in another. The nature of the talk (lots of pictures!) meant that I gave a computer talk with slides, so that the overall structure and flow of the talk was quite similar each time; however, I also tried to combine the slides with the occasional use of the blackboard, and some multimedia elements (an animation, an interactive session with a program). I believe my presentation was very similar each time. But my impression of how well the talk went and was received varied tremendously, and I am at a loss to explain exactly why. In any case, I am officially “retiring” this talk, so for the sake of variety, and while I am still at the point where everything is very coherent and organized in my mind, I will attempt to translate the talk into a blog post. This project started with my daydreaming in the bath, some time last March. I let my mind wander, and started to think about some simple piecewise-linear dynamical systems defined on the unit interval, which arise naturally in the theory of Bernoulli convolutions. Some basic questions about these systems seemed easy, and others more subtle. 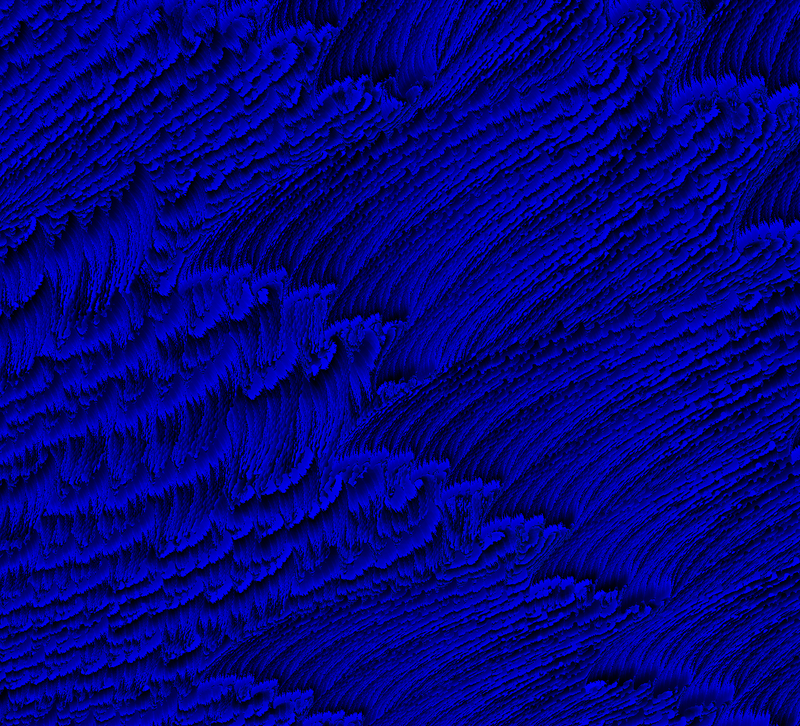 As my mind drifted, I wondered about the complexification of these systems; now the basic questions seemed harder, but it occurred to me that I could write a computer program to investigate them. Anyway, out of fascination with the apparent structure and intricacy in these dynamical systems, I pursued them further, soon sharing some ideas and questions with Sarah Koch. Shortly after, Alden Walker came on board, and we have spent a very interesting and rewarding 9 months or so teasing out some of the apparent structure that our computer programs produced, proving some things, conjecturing others, and discovering connections to work of various other people that was done over a period stretching back several decades. for some . In other words, up to conjugacy, each semigroup is specified by a single complex number of norm less than 1. In fact, I have described here not a single semigroup, but a family of semigroups depending on a complex parameter . The most natural and fundamental question is: how does the dynamics of the semigroup depend on the parameter ? In each case, since , we can color blue and color orange (and let blue win “ties” for points that are in ). 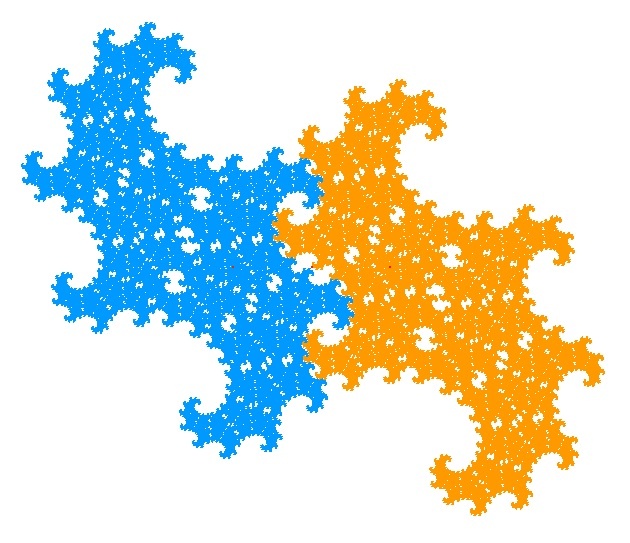 Thus, the limit set is made of two scaled, rotated copies of itself, the copies displaced from each other by a translation. The limit set can be disconnected (as in cases 1 and 3 above), or connected but not simply connected (cases 4 and 5) or topologically a disk (case 2) or a dendrite (case 6), or one of many other possibilities. There are several ways to define . One characterization of is that is is the closure of the set of fixed points of elements of . This set is obviously closed; to see that it is invariant, observe that if is fixed by , then it is also fixed by for any , and is the limit of the fixed points of . This shows that . To see the other direction, if is fixed by which starts with (say), then , so that . A third definition involves infinite words. Suppose is a right-infinite word in the generators with finite prefixes of each finite length . If we fix any point then for any we have where for some word of length . If then so is , so that is no greater than the diameter of , some fixed constant. It follows that is a Cauchy sequence, and independent of the choice of , so that there is a well-defined map from the set of right-infinite words to . We denote the set of right-infinite words by ; topologically, it is a Cantor set with the product topology, and the map is continuous, and its image is exactly . Suppose that . Then this decomposition witnesses that is disconnected. Conversely, it turns out that if is nonempty, then is connected, and even path-connected. One way to certify that would be to find some compact disk so that , and , for then , and , so that . In this case by induction we see that whenever are distinct words of length . Since the diameters of go to zero uniformly for the prefixes of a right-infinite word , it follows that in this case, is a Cantor set. In this case we call a Schottky semigroup, by analogy with the (more familiar) Schottky groups familiar from the theory of Kleinian groups. A disk with the properties above is called a good disk for the semigroup. Short Hop Lemma. If is the distance from to , then the neighborhood of is (path) connected. This is easily proved by induction. Note that if it immediately implies that for such a , the neighborhoods and are connected and disjoint; so we can define to be the filled set obtained from by filling in the holes (if any) to make it simply-connected, and then let be a disk obtained by enlarging slightly. We thus have a fundamental dichotomy: for each , either is path-connected, which happens if and only if is nonempty; or is Schottky, and is a Cantor set. So the natural question is: how does the connectivity of depend on ? Definition (Barnsley and Harrington, 1985) The “Mandelbrot set” for the semigroups is the set of with for which is connected (equivalently, for which is not Schottky). 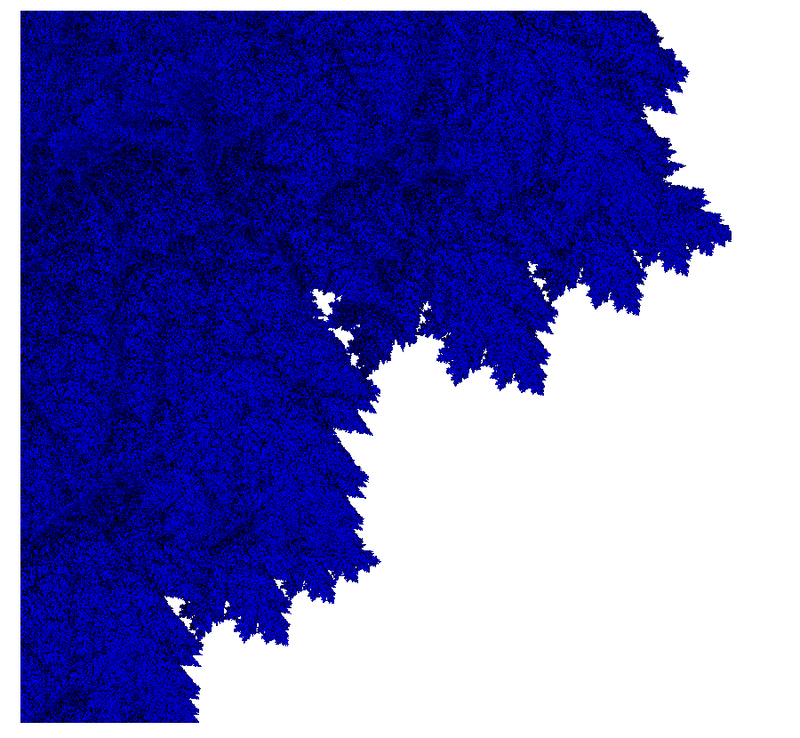 Describing is supposed to suggest an analogy with the Mandelbrot set, i.e. the set of complex numbers for which the Julia set of the quadratic polynomial is connected. Thus in this “dictionary”, the Julia set of a quadratic polynomial corresponds to the limit set of a semigroup. In the former case, the dynamical system is generated by a single complex endomorphism of degree 2, whereas in our case it is generated by two endomorphisms of degree 1. An intriguing context interpolating between both worlds are the correspondences, studied by Shawn Bullet and Christopher Penrose. Every colored pixel is some ; the Schottky are in white. The color of the pixels is of secondary importance, and concerns the runtime of the algorithm on the input which produced the picture. 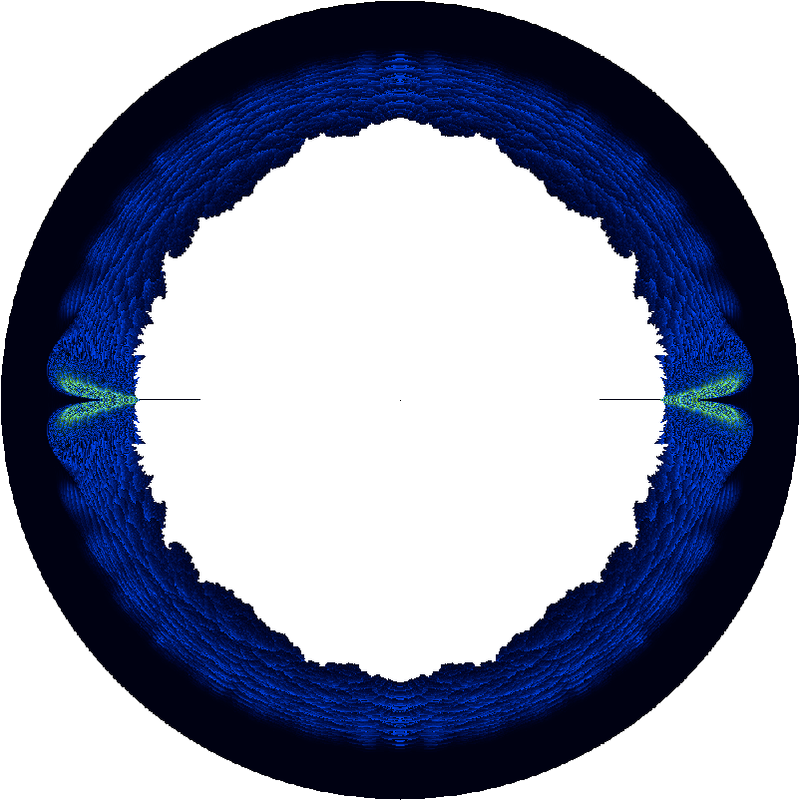 If and are both Schottky with good disks and , then the dynamics of on is conjugate to the dynamics of on . This can be proved by choosing a homeomorphism from to which is compatible on the boundaries, extending it over the forward images, and then filling it in over the (Cantor) limit sets. Thus, from a dynamical point of view, there is nothing “interesting” about the Schottky semigroups — they are all the same as each other, more or less. (Actually, it is worth remarking that and will not usually be conjugate on the entire plane. For, they are invertible on the plane, so such a conjugacy would extend to a conjugacy between the groups they generate. But these groups act indiscretely, and will almost never be conjugate). Note that the Schottky condition is open; thus is a closed set. 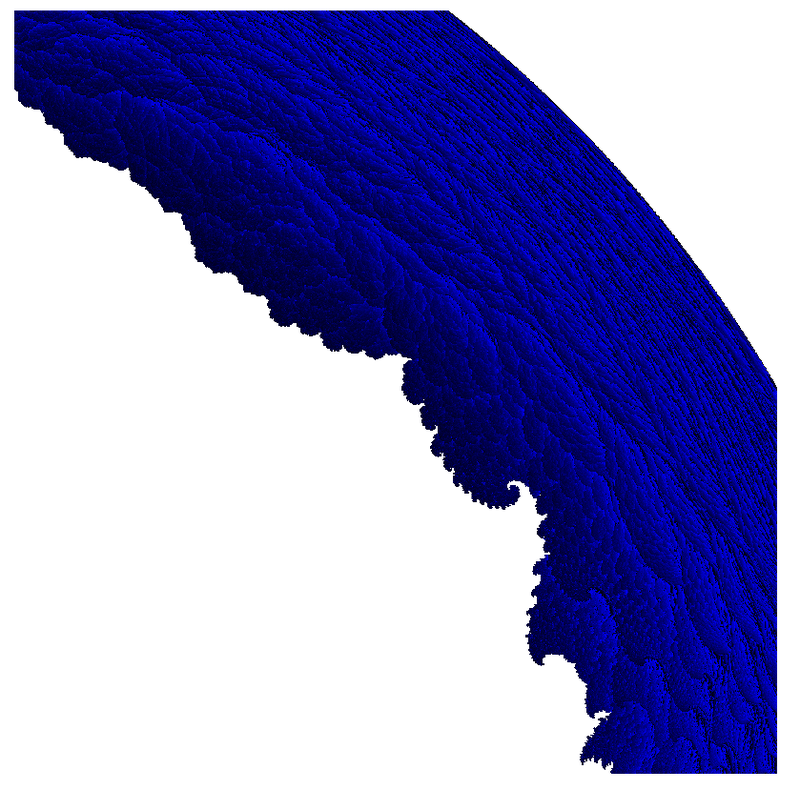 Up to this point we have introduced a family of dynamical systems parameterized by a single complex number , associated an interesting compact invariant set to each parameter , and made some connections between the topology of and the dynamics of the semigroup. But there is a special feature of this family of dynamical systems that makes them especially interesting, and that has to do with a direct connection to number theory, via roots. This is surprisingly easy to see. We have already shown that points in are of the form for any fixed , and for some sequence of words which are the prefixes of a right-infinite word . For any word of length , the map is a contraction with dilation factor , so it is necessarily of the form . How does depend on ? I claim it is a polynomial of degree , whose coefficients are or according to whether the successive letters of are or . To see this, consider how acts on polynomials in . Multiplication by just shifts the coefficients to the right by one, and then we append as the constant coefficient (for in place of we append as the constant coefficients). This proves the claim, and shows that the image of the infinite word is the value of the power series where if the th letter of is , and otherwise. Proposition: is equal to the set of roots (of absolute value less than 1) of polynomials with coefficients in . The closure of the set of all such roots (including those of absolute value greater than 1) is obtained as the union of with its image under inversion in the unit circle (together with the unit circle itself, of course). This elementary but profound relationship between roots and complex (linear) dynamics has been discovered independently many times. It was discussed in the original paper of Barnsley-Harrington, and (in a very closely related context) in a paper of Odlyzko-Poonen. 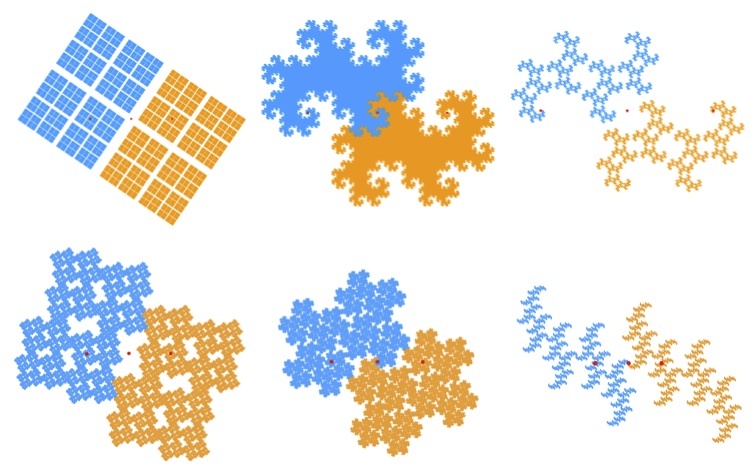 More recently, similar connections were made by Sam Derbyshire, Dan Christensen and John Baez, and in Bill Thurston’s last paper these and similar sets make an appearance because of their connections to core entropy of Galois conjugates of post-critically finite interval maps on the main “limb” of the (usual) Mandelbrot set. In their paper, Barnsley-Harrington made many experimental observations, some of which they codified as conjectures or questions, and some which they were able to prove. One intriguing and apparent feature of the picture of are the whiskers; i.e. the (totally) real “spikes” which jut into Schottky space. It appear numerically that these whiskers are isolated; i.e. that in some open neighborhood of their endpoints, the intersection with is totally real (note that if and only if ). Floating near this “exotic hole” are smaller exotic holes; when we pick a point in one of these smaller holes, and zoom in on the limit set, we discover that the “teeth” on the gears themselves have smaller “teeth”, and now the teeth-on-teeth are interlocked. When we pick a point in yet a smaller hole, we discover the teeth-on-teeth have their own teeth, and these teeth-on-teeth-on-teeth are now interlocked . . . and so on, to the limits of numerical resolution. The existence of at least one “exotic” hole was rigorously confirmed by Christoph Bandt in 2002, using techniques developed by Thierry Bousch (unpublished, but see his web page) in 1988. Bousch showed by a lovely argument that is connected and locally connected (the fact that the ordinary Mandelbrot set is connected is a theorem of Douady and Hubbard; its local connectivity is the most significant outstanding conjecture about its structure), and gave a technique for constructing continuous paths in . Bandt adapted Bousch’s techniques, and used them to give a rigorous (numerical) proof of the existence of paths in circling apparent holes, thus certifying their existence. But the apparent self-similar structure of (noted by Barnsley-Harrington) strongly suggests that if there is one exotic hole, there should be infinitely many, and perhaps even a combinatorial dynamical systems that organizes them. Bandt found a very suggestive self-similarity for at certain points, called landmark points. Giving a precise definition of these points is not straightforward, but they have the interesting property that at such a point, consists of a single point, which implies that the limit set is a dendrite. Bandt asserted, and Eroglu-Rohde-Solomyak showed, that at such points is quasisymmetric to the Julia set of some rational map; in fact, one can think of the restrictions of and to as the two inverse branches of a quadratic map with critical point at , and the conjugacy between limit set and Julia set respects this dynamics. 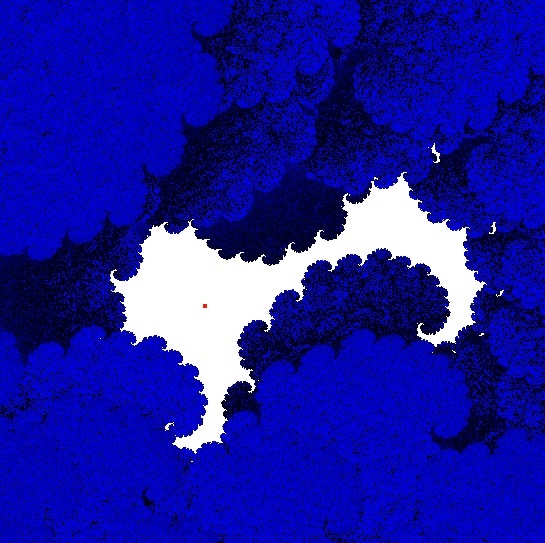 Landmark points are the analog of Misiurewicz points in the ordinary Mandelbrot set. At such a point , Tan Lei famously proved that the Mandelbrot set and the Julia set associated to are (asymptotically) self-similar. Analogously, Solomyak proved that at a landmark point , the set is asymptotically self-similar to a limit set associated to the three-parameter semigroup . So there is a natural strategy to try to prove the existence of infinitely many holes in . Firstly, find a landmark point. Second, find a nearby exotic hole; and thirdly, use self-similarity to show that the images of the hole under the self-similarity spiral down to the landmark point, and are distinct from each other. This is a good strategy, but to realize it is not straightforward. The problem is that the kind of self-similarity Solomyak proves is too weak: the rescaled copies of and converge to each other on compact subsets, but only in the Hausdorff metric. Thus, this self-similarity says nothing whatsoever about the topology of the sets or their convergence; it might be that the apparently distinct holes are connected by asymptotically infinitely thin lines to the main component, and so are not distinct after all. Conjecture (Bandt): Interior points are dense in away from the real axis. The need to exempt is already clear from Barnsley-Harrington’s discovery of the whiskers. Let me now give two somewhat complementary methods to certify that certain points are in the interior of . The first method is analytic, and is really a sort of counting argument. The second method is topological. where denotes -dimensional Hausdorff measure. On the other hand, each of and is a copy of linearly scaled by , so that . Thus so that . On the other hand, since is a subset of the plane, its Hausdorff dimension is at most 2. It follows that , which is approximately . Thus contains the entire annulus , which is thus entirely in the interior. This observation was already made by Bousch in 1988. Solomyak-Xu showed the existence of some interior points with , but their methods are somewhat restricted. The second method is the topological method of traps. 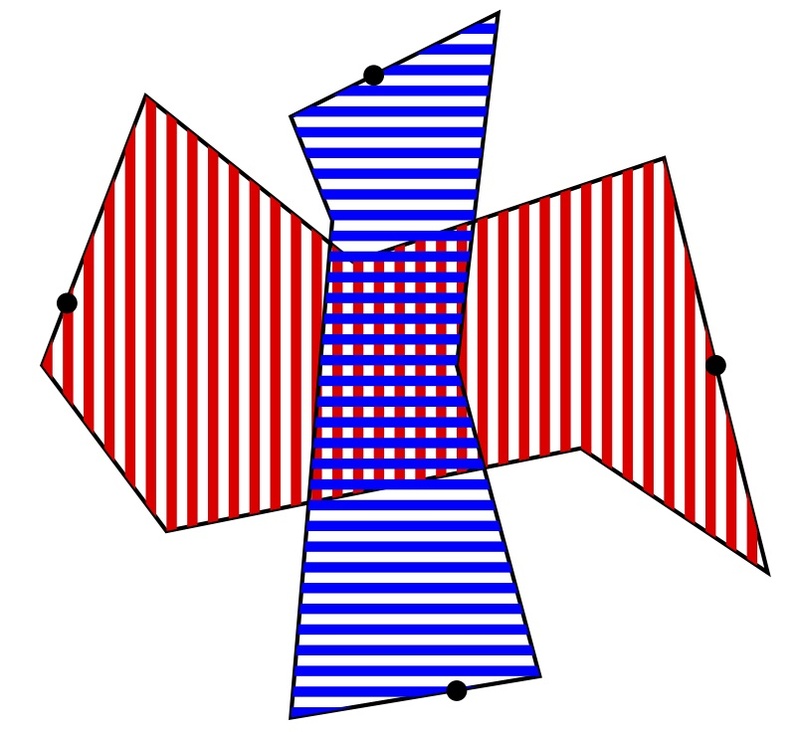 How does a topologist prove that two sets intersect? The most usual way is to use homology (or more naively, separation properties). But if is not in , the sets and are disconnected, and carry no (interesting) homology. The informal idea of traps is to suitably “thicken” these sets so that we can find approximate intersections for topological reasons, and then argue that these approximate intersections can be perturbed to honest intersections. In this figure, is red, is blue, and the four points are in black. Transversality implies that any path in from to must intersect any path in from to . so and therefore . Now, the inequality and the transversality of and are both open in , so these properties hold for all sufficiently close to , and therefore all sufficiently close are in . In other words, we have proved that any for which there is a trap is an interior point of . OK, we have a criterion to prove that some point is in the interior of , but when can we use it? First, observe that if , then and differ by a translation, so the two sets as defined above differ by a translation. So we are led to consider the more general problem: for which disks in the plane is there some for which and cross transversely? The surprising answer turns out to be: for exactly those which are not convex. That this is a necessary condition is clear. How to see that it is sufficient? This is a satisfying answer, but it raises a new question: for which is convex? It turns out that one can directly answer this question: these are exactly the of the form for which is a rational in reduced form, and . These values of are plotted in the figure below in red. 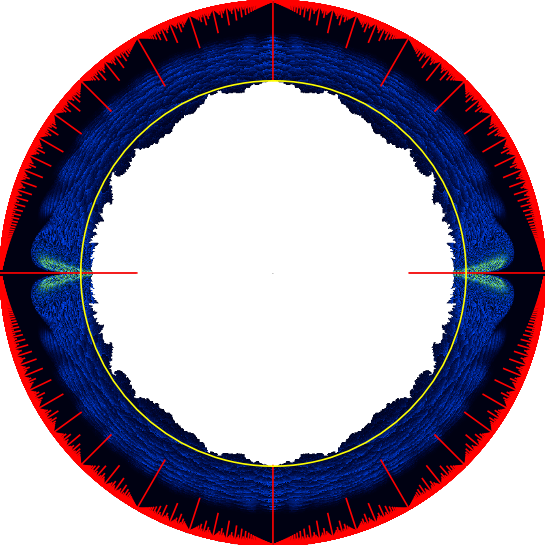 The yellow circle has radius , so that every red spike — with the exception of the real whiskers — is contained in the annulus that we already know is in the interior of for reasons of Hausdorff dimension. From here the proof of Bandt’s conjecture is almost done. Suppose we are at some point which is not real, and has so that necessarily is not convex. There is some so that and cross transversely. Since there are a pair of right-infinite words beginning with and respectively, with at . Since is holomorphic and nonconstant, it maps some neighborhood of onto a neighborhood of 0, so the same is true for for the prefixes of length . But and look like copies of translated relative to each other by . If is big, we can find a nearby for which this takes the value . Since the geometry of and is very close if and are close, we obtain a trap centered at , so that is an interior point arbitrarily close to . This completes the argument. We can use traps to certify exotic holes in . 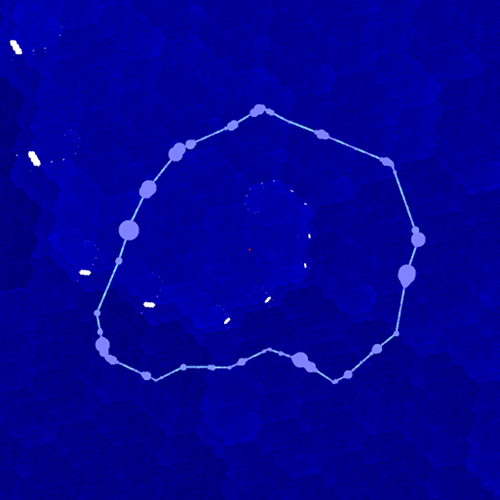 First, find the hole numerically, and surround it with a polygonal loop . If we can find a trap at some point on the loop, it certifies that an open neighborhood of that point is in . Finitely many such traps certify that all of is in , and certify the hole. What is not obvious at first is that we can use traps to certify the existence of infinitely many holes. The self-similarity that Solomyak establishes is closely related to the phenomenon of renormalization in the theory of rational maps (and elsewhere). One of the nice things about traps is that they behave in a predictable way under renormalization. That is, at a landmark point , if we have an (approximate) self-similarity fixing , and if some nearby point is a trap for words , then there are words obtained in a predictable way from which are a trap for (there are several quantifiers and estimates implicit in this claim; in any case it is “asymptotically true” in the limit near ). It is therefore possible to produce a loop in surrounding a landmark point which can be covered by (finitely many) traps, and then show that the images of these traps under renormalization persist and certify that the images are also in , and we get an infinite sequence of concentric annuli which certify that a renormalization sequence of holes are really disjoint from each other. The tip of the “spiral” is , a root of . On the left is a (rescaled) part of the limit set of the three-generator semigroup described above. On the right is part of near ; the resemblance is clear. This figure shows a loop of renormalizable trap balls, separating some exotic holes from the rest. The forward images of this loop certify the existence of infinitely many holes, limiting to . 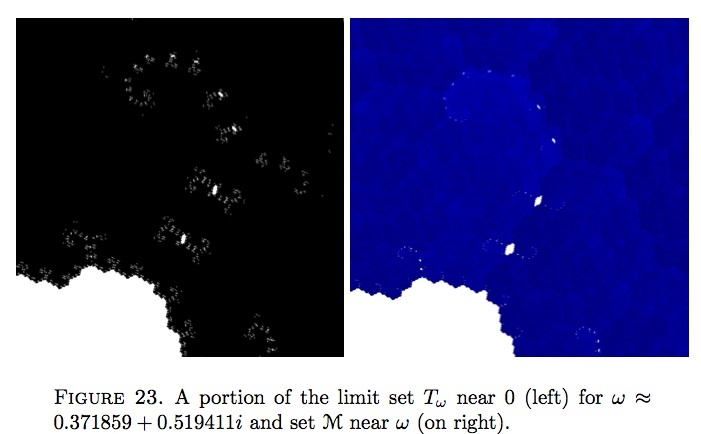 The point as above is pretty special, and the proof that it is a limit of tiny holes is somewhat ad hoc, being an interesting mixture of theory and numerical certificates. However, we (Sarah, Alden and I) make the following related conjectures. First, we denote by the “boundary” of ; i.e. the complement of the set of interior points. Conjecture: Algebraic points in are dense in . Conjecture: Every non-real point in is a limit of a sequence of holes with diameter going to zero. This entry was posted in Complex analysis, Dynamics, Hyperbolic geometry, Number theory and tagged Bandt's conjecture, Barnsley-Harrington, complex dynamics, Julia set, landmark point, limit set, Mandelbrot set, Misiurewicz point, pairs of similarities, polynomials, roots, Schottky semigroups, Solomyak, traps. Bookmark the permalink.